Terra Incognita: Liberating the Wall from Whom? Several weeks ago I went with my wife and her family to the Western Wall. Her family is Ethiopian and Ethiopian women sometimes wear colorful shawls. When we approached the wall and her mother went down to the women’s section we joked about whether the shawl would be mistaken for a tallit, or prayer shawl worn by Jewish men. Apparently it wasn’t. However it is the custom, and the law, at the Western Wall that women do not wear Jewish men’s tallit, tefillin or read from the Torah in the women’s section. This all gains more potency every month when the Women of the Wall, a Reform Jewish protest group, go to the Western Wall on the first day of each Hebrew month, Rosh Chodesh. Each month the routine is sort of the same: The dozen or more women arrive wearing tallits and carrying a Torah and they are then escorted away or sometimes arrested for disturbing the peace. Then the blizzard of press releases are sent out about the arrests, and the opeds and interviews begin to appear about freedom of worship being curtailed. 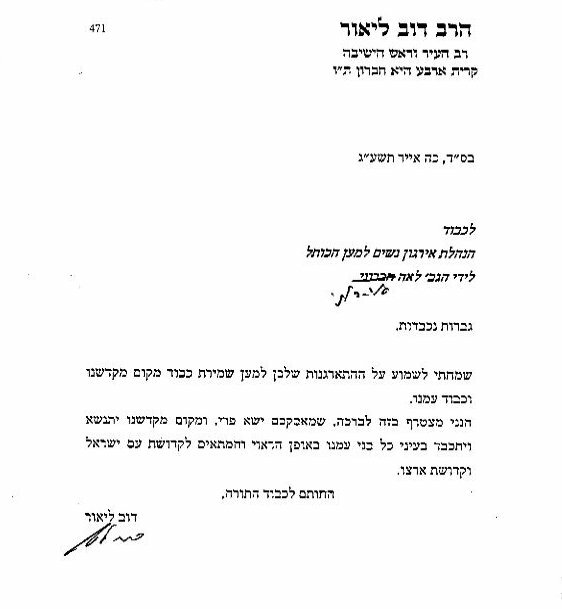 This gained a great deal of press in October when leader Anat Hoffman was arrested and claimed she was abused by police, and made to share a cell with commoners, including a woman accused of prostitution. American Jewish leaders were outraged. Marcie Natan, the president of Hadassah, at whose conference Women of the Wall was founded in 1988, demanded the police “bring to justice” those who had abused Hoffman. Rick Jacobs, President of the Union for Reform Judaism, called Israel’s Ambassador Michael Oren to emphasize the anger of his congregants. The National Council of Jewish Women said it was “another shameful chapter in the treatment of women praying at the wall.” Bradley Burston compared the treatment of Hoffman to a dark regime where “state funded clerics” command a police force that enforces orthodoxy, like in Iran. The United Synagogue of Conservative Judaism called for flash mobs to protest the arrest. Hoffman’s crusade was further illuminated in an interview in The Jerusalem Report. A daughter of a wealthy kibbutz on Jerusalem’s periphery, Hoffman relates that she was raised in a secular household that eschewed rabbis and religion. After studies in the US she returned to Israel to become an activist for “religious pluralism.” Following years of protesting at the Kotel the Israeli Supreme Court in ruled in 2003 that it was acceptable for the state to ban certain practices at the Wall, among them women wearing tallits in the women’s section. The Women of the Wall were provided a separate area of the Wall to pray at, called Robinson’s arch, in an archeological park. But after several years there Hoffman and her group became unhappy. THE CAMPAIGN of the Women of the Wall is an interesting one. It pits a small group of people ostensibly protesting for religious pluralism against Orthodox Judaism and the state. But there is another side to the story that is not often acknowledged, especially by the more liberal sections of the American Jewish community that tends to have a kneejerk reaction to any attempt to enforce rules at the site. There is a notion that Hoffman and others have a “right” to do as they please at the Kotel. The argument is that the Kotel belongs in some way to all the Jewish people and since not all Jews pray the same way, therefore all types of prayer should be allowed. But this poses a fundamental issue that all open societies face; when does one person’s rights infringe on another’s? For instance, Muslims may claim they have the right to the call to prayer, but does the call to prayer infringe on others’ right to quiet? Do Orthodox Jewish women have a right to pray in quiet on Rosh Chodesh and not feel intimidated in their holy site by singing and religious activity they may feel are offensive? If the Women of the Wall have a right to do what they like in the women’s section, do they not have a right equally to be in the men’s section? Do they not have a right to go onto the Temple Mount, which is also a Jewish holy site, and pray there (where the state and the Islamic Wakf also forbid Jewish prayer)? There is evidently a point at which one person’s “right” to do something ends where another person’s begins. When Elsye Frishman of the Barnert Temple in New Jersey recently came to the Wall with a group of women from Netzer, the Reform movement’s international youth group, she bragged in an Oped about only speaking English when she was confronted about her tallit; “I did this because I am not Israeli, and wanted to be clear throughout that I am a Jew. The Western Wall is the universal site of prayer for Jews.” Rhea Wolfson of Netzer wrote that the event was “tikkun olam, Reform Zionism and Reform Judaism in action.” The vocal and aggressive actions, the singing, the posse of photographers and media that follow each month’s protest, can be viewed as an attempt to force American style Reform Judaism on the quiet and solemn traditional women who want to observe their prayers. Women like my mother-in-law are brushed aside in a paternalistic Orientalit crusade to “universalize” the Wall and liberate it from the people who make up the majority of its frequent visitors; the Orthodox and traditional people who live in Israel. ALMOST EVERY protest on behalf of Hoffman and her group misses the point. The concept of the flash mob of women reciting the Shema is totally misplaced, as it implies women are forbidden from chanting prayers in public in Israel. But this is nonsense. The state has only delineated 2,000 square feet where women are not permitted to perform certain actions due to the holy nature of the site. The Western Wall is certainly not the only holy site where certain customs are enforced. The Sikh Golden Temple in Amritsar bans shoes, and the Temple Mount is off limits to non-Muslims at all but specific times. What is at issue here is not really the question of pluralism at the Kotel, but rather which Jewish group should dominate it. 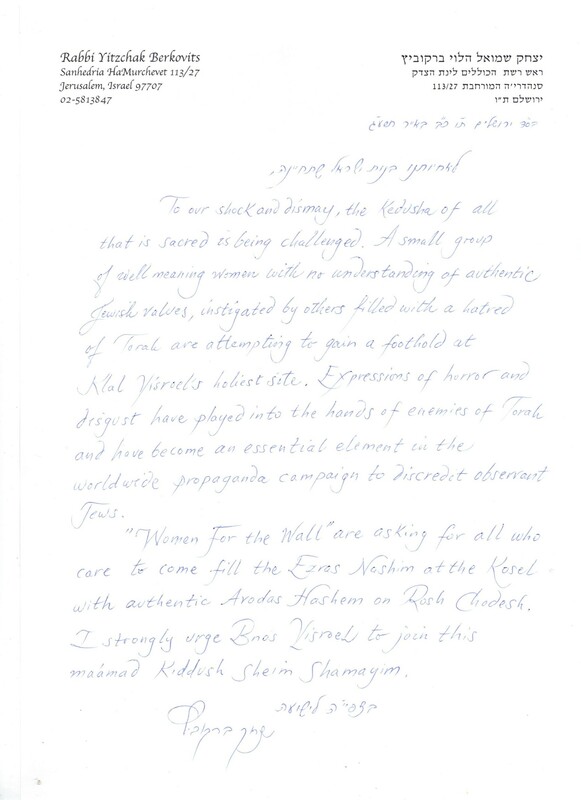 Hoffman states, “it is too important to be left to Israelis” and “I want the Wall to become a national monument open to all, including the ultra-Orthodox.” In a sense, this implies a foreign colonization of the Wall, because Israel and the Orthodox, who play a major role in the state, are not good stewards. Their notions of what is proper would not influence the site. THE KOTEL should not be home to religious fanaticism. My mother-in-law shouldn’t be cautioned against wearing a pretty Ethiopian shawl to her religious site just because of moronic notions of what is a tallit and what is not. There should not come a day when only the “right” kind of Orthodox women can go to the holy site, but that being said, there is no reason to change the site’s rules for a group that manifestly seems too often interested only in itself and its narrow agenda.